The journey to the public cloud is underway. A recent survey found that typical enterprises augment their private data center with six public cloud providers. But how do you enable applications and services to span all of these clouds? The agility and flexibility benefits of the cloud are lost if you simply lift and shift infrastructure silos to multiple clouds. However, advances in software-defined storage provide a "universal data plane" that synchronizes data across private and public clouds. Watch this webinar to learn how you can create a multi-cloud primary storage solution that can span any cloud, including a demo of storage that spans AWS, Azure, and Google. The inevitable march to the cloud has begun and Hybrid Cloud is a huge milestone in that journey. It’s easy to use on-prem infrastructure and public cloud in parallel for your workloads, but a lot of friction occurs when these two worlds come together. High Availability, security, and interoperability are just a few. Demand for Data Sovereignty and GDPR throws another wrench into the mix. Storage solutions need to keep up with evolving demands and SDS will play a huge part in making Hybrid Cloud a reality. Intro webinar and demo featuring Hedvig CEO and co-founder Avinash Lakshman. Learn how software-defined storage transforms your data center and delivers more agile and lower cost data management for VMware and Docker, spanning on premises and public cloud. How can enterprise IT operate more like AWS? That is the defining technology question of the decade. Hyperscale computing models pioneered by AWS catapulted “cloud” to the top of the IT agenda. This model fuels digital business, creates tectonic shifts in IT spending, and upends legacy IT infrastructure vendors. But should today’s CIOs build or buy their own cloud? The simple answer: both. We live in a multi-cloud world. A hyperscale strategy balances digital services across private and public clouds. -Lessons learned from building two of the world’s largest distributed systems: Amazon Dynamo and Facebook's Cassandra. -How to develop a multi-cloud strategy for modern data centers that accommodates both virtualized and containerized applications. -Where software-defined storage fits into this strategy to help data span cloud boundaries and avoid cloud lock-in. Announcing 3.0 release! Watch our webinar to see all the new features. We'll introduce optimized multi-cloud flash, new security capabilities, and integrations for continued ease-of-use. Enterprises are evolving their vSphere environments from standard DR configurations to high availability (HA) architectures. VMware vSphere Metro Storage Cluster is a key capability in this evolution. Parallel to this, companies are embracing hybrid cloud and AWS in particular. In many cases enterprises treat AWS as a passive DR site. But what if you could evolve AWS to be part of an HA stretch cluster? That’s where software-defined storage (SDS) comes in. SDS solutions provide the flexibility to run on commodity servers as well as cloud computing instances. Couple that with advanced multi-site replication, per-VM storage policies, deduplication, snapshotting, cloning, and VMware’s recent announcement with AWS, and SDS is now the ideal enabler for automated failover in a hybrid cloud stretched cluster. - Provide an architecture for software-defined storage running a stretched cluster between a private vSphere cloud and AWS. - Discuss how this provides seamless failover, HA, DR, and cloud bursting—all at scale. - Highlight how data efficiency techniques like deduplication, thin provisioning, auto-tiering, and caching optimize hybrid cloud economics. Chris is a VMware Certified Design Expert (VCDX) and senior solutions architect at Hedvig. Chris has in-depth experience in cloud, virtualization, storage, data center, and software-defined technologies gained from his work across numerous practices including web development, systems administration, and consulting. His advisory expertise helps customers better adopt and adapt to the technologies that best fit for their business requirements. Let's explore SDS as a foundation to rack-scale converged and hyperconverged solutions. Guest speaker Richard Fichera, VP & Principal Analyst at Forrester will join Hedvig's Rob Whiteley to provide an overview of current enterprise infrastructure adoption, best practices, tips and recommendations for modernizing storage infrastructure. -Why enterprises are looking to converged and hyperconverged solutions to provide cloud-like infrastructure. -How software-defined storage is a critical component of these infrastructures. -What use cases and scenarios are gaining traction as software-defined storage matures. -How the Hedvig Distributed Storage Platform provides a foundation for rack-scale infrastructures. Rob Whiteley, VP of Marketing, Hedvig Inc. Many large organizations either can’t or won’t go all-in on the public cloud. Regulatory compliance, legacy infrastructure, and costs drive these organizations to build private clouds. Do you invest in VMs or containers? Do you use OpenStack, Kubernetes, or Mesos to orchestrate your cloud? How will you bridge your private cloud with AWS, Microsoft Azure, or Google Compute Cloud? You need a flexible architecture that not only embraces all the above, but facilitate frictionless movement among them. 1. Support any hypervisor, container, or cloud platform – simultaneously. 2. Plug into any cloud orchestration tool to automate your private cloud. 3. Integrate public cloud – and not just bolt it on – when you’re ready. 4. Create self-service storage and sandboxes for DevOps environments. Software-defiend storage can dramatically improve the economics of your datacenter. The power of commodity hardware with storage software lowers costs by 60% or more. But what if you’re going to the public cloud? Software-defined storage helps there. In fact, for many enterprises, it’s accelerating their journey. Watch this webinar to learn how software-defined storage can synchronize data across private and public clouds, enabling true application portability. Software-defined Storage Service interruptions wreak havoc on business. Enterprises expend huge budgets to deliver datacenter redundancy and continuous application availability and still it is not easy. Storage is often the biggest limiting factor. The good news is that recent storage innovations combined with the flexibility of VMware vSphere simplify and lower the cost of delivering automated mobility of services between sites to ensure downtime avoidance and fault recovery. Learn from Docker and Hedvig about Docker Datacenter and the Hedvig Docker volume plugin that simplifies storage integration and management with containers. 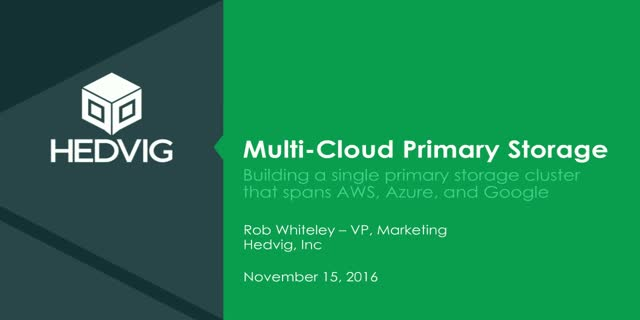 Mike Rinken, Director of Technology at Mazzetti, describes how he uses Hedvig with Veeam and Amazon as a backup target and active archive. Storage is critical to OpenStack production deployments, along with performance, reliability, scalability and flexibility. Modern software-defined storage (SDS) solutions address the challenges of real-world OpenStack environments. Storage architectures have evolved to meet ever-changing business demands. Today’s enterprises need the flexibility to place workloads where they make the most sense and achieve objectives for resiliency and growth without introducing unnecessary complexity and cost. If you have storage initiatives focused on virtualization, backup, archiving, or cloud, attend this session to learn new strategies for building a more agile, multi-site storage infrastructure at lower cost. The world of backup, disaster recovery, and business continuity is being disrupted by new approaches taken from the playbook of web-scale companies like Google, Amazon, and Facebook. Enterprises are adopting distributed systems-based, software-defined architectures that simplify management, streamline protection, increase uptime and reduce costs by as much as 60%. Your world will be hybrid for the foreseeable future. You will combine a mix of on-premises private cloud and public cloud infrastructure to meet ever-changing business demands. But how do you build a storage architecture designed to support this hybrid world? 1. Build an OpenStack “landing pad” to onboard applications born in public clouds like AWS. 2. Create hybrid AWS-based applications with on-premises infrastructure that migrates older, colder data to the public cloud. 3. Treat public clouds as “DR sites” where applications are automatically protected across data centers and clouds. 4. Store data on private, hosted infrastructure that bursts to the public cloud for compute. Today's modern businesses drive new technology initiatives like big data, cloud, and microservices to fuel business innovation. But these same technologies result in exponential data growth. Your challenge: How do I respond fast enough to the business and economically scale and store all that data? •How the latest business initiatives impact your storage. •How you can use Hedvig as a modern platform to curb explosive data growth. •A sneak peek at ESG's hot-off-the-press Storage Trends research report. In today's world of unprecedented growth in enterprise storage demands, traditional infrastructure provisioning and management methods just aren’t capable of keeping up with the frequent adjustments required within modern enterprises. New industry research sheds light on how software-defined storage gives modern enterprises a competitive edge, offering improved scalability, performance, and ease of use. Please join us for an upcoming webcast on May 19th, featuring guest speaker Sr. Research Analyst Henry Baltazar with Forrester Consulting who will share insights on the growing need to rethink traditional data storage and on where the data industry is heading. Eric Carter, Sr. Director of Product Marketing at Hedvig will share how Hedvig’s new software-defined storage solution can deliver modern storage for any enterprise compute environment. The Hedvig Distributed Storage Platform brings new agility to your data center. A software-defined approach lowers your storage costs, helps you manage more storage with fewer resources, and provides unparalleled resiliency across private and hybrid clouds. Hedvig combines block, file, and object storage to support any application and the flexibility to run on any x86 or cloud instance. Hedvig will enable you to transform your storage into a fundamental enabler of your digital business strategy.